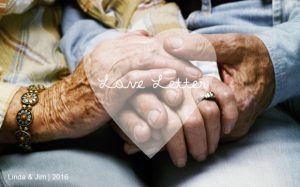 Impact NW receives a touching letter filled with love from a former senior client. Every once in awhile we open our mailbox to find a treasure. It’s a reminder to us at Impact NW that there are beautiful stories among the work that we do. 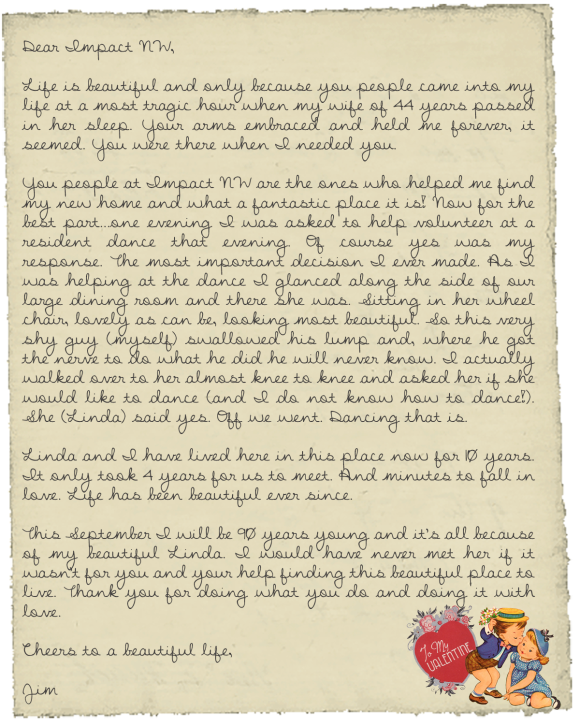 This month we received a touching letter that we wanted to share with you – just in time for Valentine’s Day! Jim is a senior client that we helped previously after he lost his wife of 44 years. He needed help finding housing and organizing his bills. An Impact NW Senior Services advocate helped Jim navigate through these decisions and got him settled into where he is today. Life is beautiful and only because you people came into my life at a most tragic hour when my wife of 44 years passed in her sleep. Your arms embraced and held me forever, it seemed. You were there when I needed you. You people at Impact NW are the ones who helped me find my new home and what a fantastic place it is! Now for the best part… one evening I was asked to help volunteer at a resident dance that evening. Of course, yes was my response. The most important decision I ever made. As I was helping at the dance, I glanced along the side of our large dining room and there she was. Sitting in her wheel chair, lovely as can be, looking most beautiful. So this very shy guy (myself) swallowed his lump and, where he got the nerve to do what he did he will never know. I actually walked over to her almost knee-to-knee and asked her if she would like to dance (and I do not know how to dance!). She (Linda) said yes. Off we went. Dancing, that is. Linda and I have lived here in this place for 10 years. It only took 4 years for us to meet. And minutes to fall in love. Live has been beautiful ever since. This September, I will be 90 years young, and it’s all because of my beautiful Linda. I would have never met her if it wasn’t for you and your help finding this beautiful place to live. Thank you for doing what you do and doing it with love.